Egypt’s presidential spokesperson said it is better for Mohamed Morsi to die in defense of democracy than to be blamed by history. His comments come as an army ultimatum to solve the ongoing political crisis is expiring. Morsi believes it would be better to die “standing like a tree,” defending the electoral legitimacy of his office, than to go down in history as having destroyed Egyptians’ hopes for democracy, Ayman Ali, the spokesperson said, as cited by Reuters. 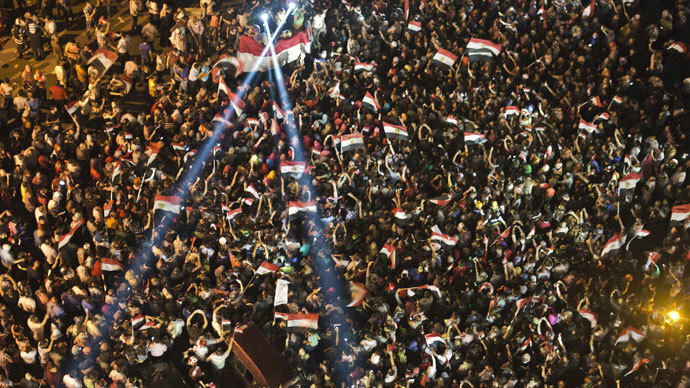 Earlier, the Egyptian army issued a call to arms in a statement headlined "The Final Hours", which vowed to restore order as the country remains gripped by violent protests. 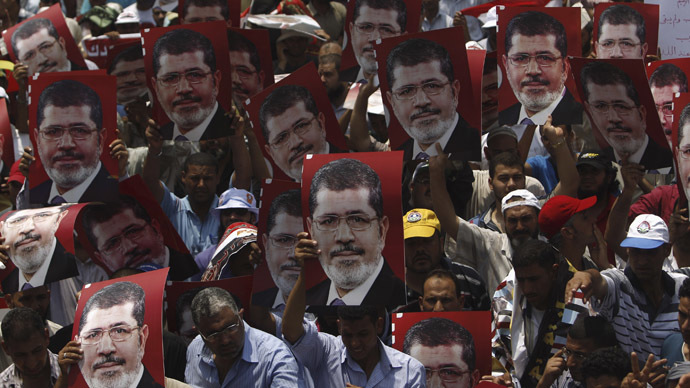 The military brass said they were willing to shed the blood of "terrorists and fools" once Morsi refused to step down from power. 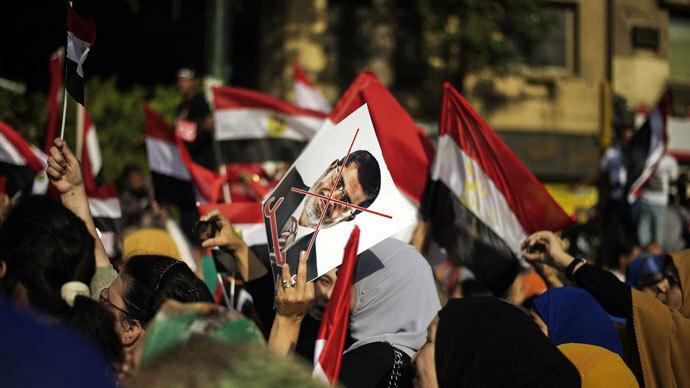 The Muslim Brotherhood, in their turn, declared the movement was ready to become martyrs to defend the president. "There is only one thing we can do: we will stand in between the tanks and the president," Gehad El-Haddad, the MB official spokesman, told Reuters on Wednesday. 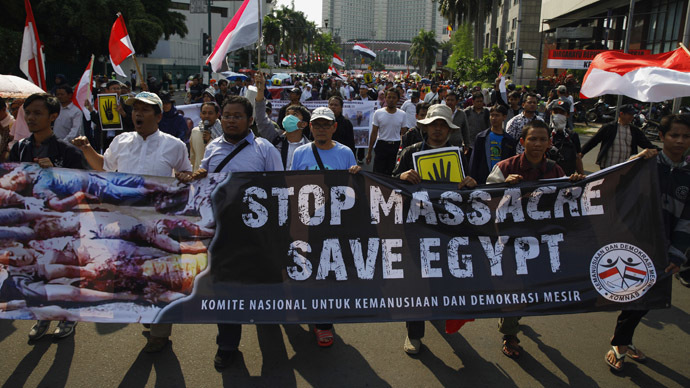 "We will not allow the will of the Egyptian people to be bullied again by the military machine." The Brotherhood also refused an invitation to meet the armed forces commander on Wednesday, just hours before the military deadline for Morsi to surrender to the opposition demands or to quit. “We do not go to [meeting] with anyone. 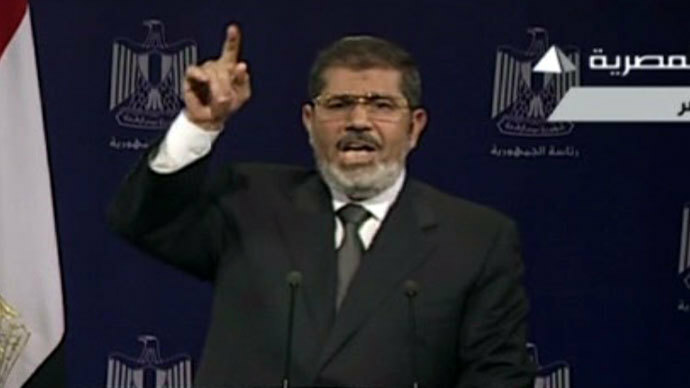 We have a president and that is it,” Waleed Haddad, a senior leader of the Brotherhood’s political wing told Reuters. Meanwhile, reports from Cairo suggest the military have taken over a state TV building, with military officers monitoring content in the TV newsroom before the ultimatum. Armored vehicles appear to have been deployed across the capital. 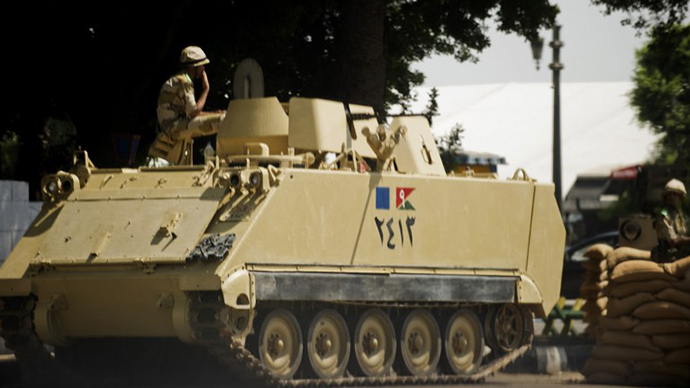 On Monday, Egypt’s Defense Minister consulted with advisors and issued a statement that was read on Egyptian TV. The central command of the army gave a 48-hour ultimatum to the President to resolve the crisis or give up to the demands of the opposition. It was not absolutely clear what were the exact demands and what would happen if they are not met, but many saw it as a threat to step in. Reuters, citing military sources, reported that the Army had drafted a plan to sideline Morsi, suspend the constitution, and dissolve the parliament’s Islamist-dominated upper house after the ultimatum expires. Under the draft, an interim council coordinated with political leaders would rule, there would be amendments to the constitution as well as a new presidential vote, the sources said. No comments were made though regarding Morsi’s fate.